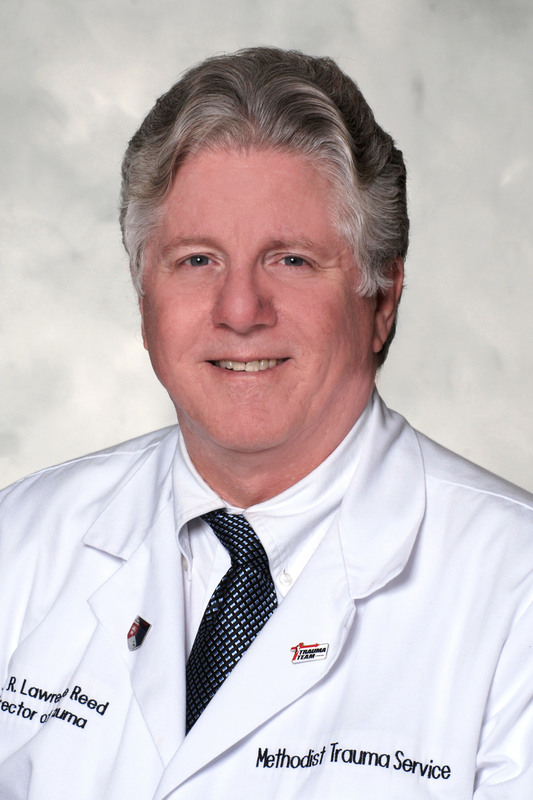 Dr. Larry Reed, a board-certified surgeon and specialist in surgical critical care, is Professor of Surgery at Indiana University and an Acute Care Surgeon and former Director of Trauma Services at IU Health Methodist Hospital in Indianapolis, IN. Dr. Reed received his medical degree from the University of Virginia School of Medicine in Charlottesville and completed an internship and residency in General Surgery at William Beaumont Army Medical Center in El Paso, Texas. He was named a postdoctoral research fellow in respiratory physiology at the Virginia Mason Research Center in Seattle and completed a fellowship in trauma and burn research (through the auspices of the National Institutes of Health) at Harborview Medical Center of the University of Washington, also in Seattle. His professional responsibilities have included: Associate Chief of the Trauma Service and Surgical Intensive Care Unit at Hermann Hospital (Houston, TX); Chief of General Surgery at the LBJ General Hospital (Houston, TX); Director of the Surgical Intensive Care Unit and Director of the Trauma Center, Duke University Medical Center; Chief of the Division of Trauma, Surgical Critical Care, and Burns at Loyola University Medical Center; Director of the Surgical Intensive Care Unit at the Edward Hines, Jr. VA Hospital; and the Director of Quality Improvement for the Department of Surgery at Loyola University Medical Center. A Fellow of both the American College of Surgeons and the College of Critical Care Medicine, Dr. Reed is a member of over 20 professional organizations. He is a Past President of the Western Trauma Association. He has been invited as a Visiting Professor to over 30 healthcare institutions. He has served as a member of the Consultant Committee for Surgical Critical Care for the American Board of Surgery. He has also served as a member of the Area Committee on Alternative Site Testing for the National Committee for Clinical Laboratory Standards. He has authored or coauthored more than 60 peer-reviewd journal articles and 27 book chapters, mostly dealing with critical care, surgical infections, and trauma. Dr. Reed has long been interested in surgical infections, especially the pharmacokinetic alterations that occur in critically ill and injured patients and how such changes impact the effectiveness of antibiotics. Among his many other major interests are the use of computerized databases for routine clinical care and quality improvement, resuscitation physiology and monitoring, the influence of hypothermia on blood coagulation, and effective coding and documentation for professional billing purposes. I love the premise of your blog and am looking forward to reading posts – very cool blog design as well!